One of the pleasures of walking is knowing the history of your path, why it exists and who walked there before. The need for Corpse Roads disappeared centuries ago, though a few are still known by that name. When population was low and villages were widely scattered, the nearest consecrated ground could be miles away, across harsh and inhospitable terrain. Sometimes coffins had to be abandoned in blizzards, miles from anywhere. When weather improved, they would be picked up and the journey resumed. Coffin-bearing horses bolted with fright during storms, never to be seen again, but living on in legends and ghost stories. 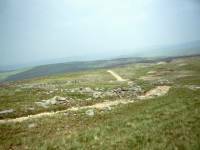 In the Pennines, the Corpse Road of Cross Fell took people from the hamlet of Garrigill on an arduous 16 km route over an 800 m pass to Kirkland in the Eden valley. Cross Fell is the highest point in the Pennine Hills with a summit at 893 metres, and is prone to dense fog and fierce winds. They say that on a clear day you can see both coasts of north England from the top. The Corpse Road acquired other uses, serving the lead mines, whose shafts gape menacingly at today’s Pennine Way walkers. The hard rocky path is tiring for sore feet but it’s clearly marked, which can come as a relief after the featureless heights of the Cross Fell plateau. In the Lake District, the dead of Mardale Green were taken on a zigzagging route up Selside Pike, and over rough pasture and moorland to St. Michael’s church at Shap, almost 11 km away. Mardale villagers complained bitterly about the expense and danger this entailed. They had to go to Shap for baptisms as well as burials, and suffered for the precarious state of their babies’ souls every step of the way. Then in 1936 the burials at Mardale ceased. With the valley about to be flooded by the Haweswater reservoir, there was a return to the old ways: the bodies at Holy Trinity were disinterred and taken to Shap for reburial. This photo shows the view from the Corpse Road today. The photographs featured here are from two useful accounts of walks that have been posted to guide others: a challenging 19.4 mile section of the Pennine Way from Dufton to Alston and a walk on the fells above Haweswater Reservoir.